After pre-celebrating with friends over Belgian beer last night, I'm celebrating my 30th birthday today in the best possible way -- relaxing with Paul and the cats, knitting, making soup, and watching the new Sense and Sensibility adaptation on PBS. 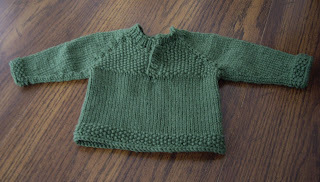 The yarn is Elann's Peruvian Baby Silk, which is OK but not quite as nice to work with as their Peruvian Baby Cashmere. The first corner is done! 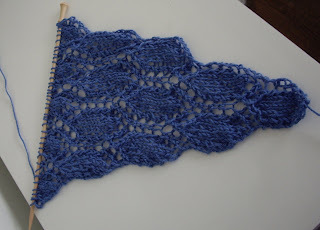 For a long time I didn't like knitting lace or cables from a chart; now I realize that I'm perfectly happy as long as the chart is very clear, easy-to-read, and uses symbols that make sense. Any recommendations for very clear lace charts? I can't promise a huge lace shawl or intricate socks, but it will definitely be something that matches your tastes! Leave me a comment if you're interested. U.S. only, please, due to mailing costs and my limited grad student budget. I've spent the afternoon in the kitchen, preparing for an evening of tapas, sangria, and good friends. Snow may be falling outside, but in here it seems a lot more like Spain than Chicago. Why this is called Russian, I have no idea. It's a Spanish recipe, through and through. 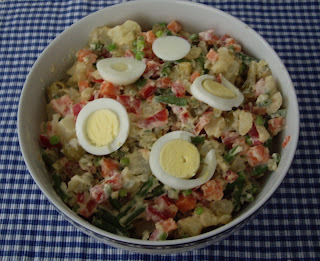 While similar to potato salad, it involves more vegetables and features more complex flavors. If you're pressed for time, you could use mixed vegetable giardinara (probably not the hot version, though). You can add capers, if you like. Fill 2 medium-large saucepans with water to boil. Peel the potatoes, slice 3/4" thick. In the first saucepan, boil potatoes until tender. Cool, then dice. I boil these separately since the potatoes generally take longer and are a little trickier to time. Into a bowl, put potatoes, carrots, peas, and beans. Stir in onion, pepper, pickles, olives and mayonnaise while vegetables are still warm. Refrigerate until chilled. Arrange egg and chopped parsley on top before serving. The rest of the menu? Combine first 4 ingredients in a large pitcher or punch bowl. Sweeten to taste with sugar, stirring well to dissolve. Add half of the citrus fruit slices. Cover and refrigerate for at least 2 hours. Stir in club soda just before serving. Serve over ice in large glasses, with citrus slices. Modifications: I modified the pattern in a number of ways, and I'm very happy with the results. My goal was to make the sweater easier and more fun to knit. I knit it in the round from the bottom up. Rather than bulky hems on both the waistband and sleeves, I did 2x2 ribbing. 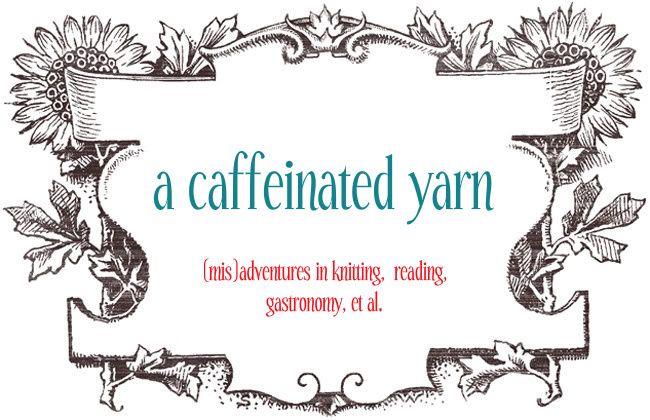 Next time I would go down a needle size for the ribbing. I eliminated the complicated short rows on the sleeve caps. I just picked up 42 stitches evenly around the armhole, starting at the underarm. I placed a marker, then knit in the round, decreasing 1 stitch at each end every 6th row -- following the directions, "Work in stockinette, decreasing every 1 stitch on each side every 6th row. (K2, K2tog, K to the last 4 stitches, K2tog tbl, K2)". Except I forgot about the "tbl" part, and it still looks fine. I love the big 1970s-style ribbed collar. A great little knit! The yarn is soft and nice to work with. 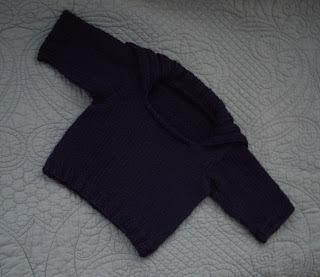 It stretches a good deal, which is fine for a baby sweater. One ball had LOTS of knots; however, I figure you get what you pay for. 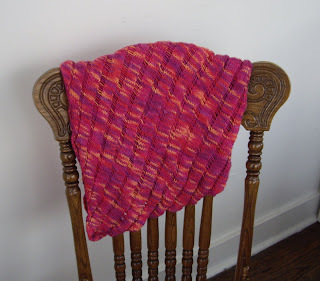 It's inexpensive, soft, and machine washable -- perfect for this project. This is my first time using the Harmony needles, and they're fabulous -- nice flexible cord, pointy (but not too pointy) tips, just enough bend. 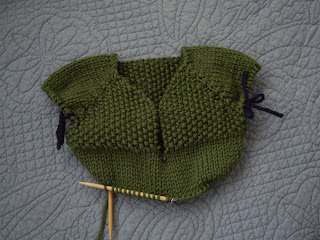 There's also an Organic Guernsey (by F. Pea) in the works. Once again, I'm using Knit Picks Swish Superwash, in Dublin this time. A great color for this time of year! A bonus shot of Kylie's enormous tummy! 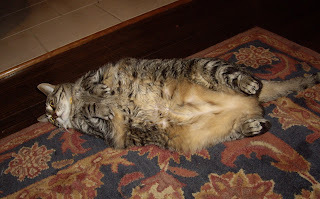 When we adopted her, she was a VERY LARGE girl (with a very petite frame). She has slimmed down quite a bit, but is still not exactly svelte. Still waiting for official results on my last prelim exam, but my adviser unofficially gave me good news already. Huzzah, huzzah! It turned out so well! Many knitters pitched in to help. Gauge was essential since the fish interlock. 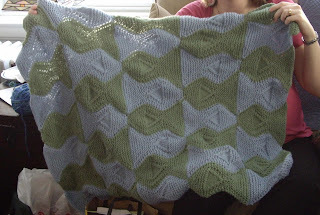 Gauge is a harsh mistress, indeed -- people used between size 8 and size 10.5 needles! Since I was crazy with my exams last week, most of the seaming had to wait for last weekend. We had a marathon seaming session on Saturday (6+ hours), and I put in another couple hours on Sunday morning, just in time for the shower. Much fun was had by all; many cupcakes were consumed; and plenty of knitting took place. Sarah has a very nice post about the shower here (plus photos of her sweet dogs). P.S. Many thanks to everyone for the good-luck wishes on my exams! It's such a relief to be done, though I'm still waiting for the results. 1) Why aren't microfleece yoga pants considered regular attire? They're the best part of exam week. 2) Coffee and tea, how I love thee. 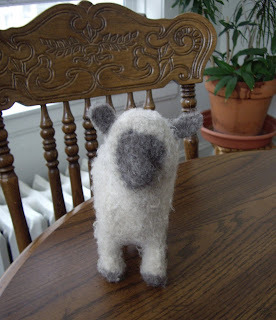 3) No knitting makes me a very sad girl. 4) Maybe putting the cats' litter box in the study wasn't such a great idea after all. I'm hanging in there -- almost done! Hope you're all having a great week. 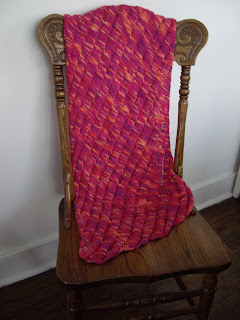 Mia, one of the most thoughtful and generous people, made me a gorgeous gift -- a Clapotis! It's so soft and warm and wonderful -- the silk in the Lion & Lamb just makes it glow. It is going to keep me cozy while I write my prelim all next week. Not only did she knit me a Clapotis, she sent me a care package with hot cocoa, Prince of Peace ginger and honey drink crystals (delicious! 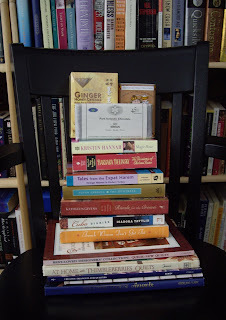 If you like crystallized ginger, you need to find this), some of the best chocolate I've ever tasted (Noi Sirius from Iceland), and a bunch of books. Mia's a big reader, as am I , and our tastes overlap but aren't exactly the same. So we've been exchanging boxes of books and broadening our reading horizons.